In the Shadow of Swords was definitely an interesting read for me: though I enjoyed it, I suspect it's again a somewhat divisive novel (I seem to be covering quite a few of these - subjectivity is fun this way!). I'll explain why, but first I should give the author, Val Gunn some credit for setting the book outside the typical pseudo-Europe. 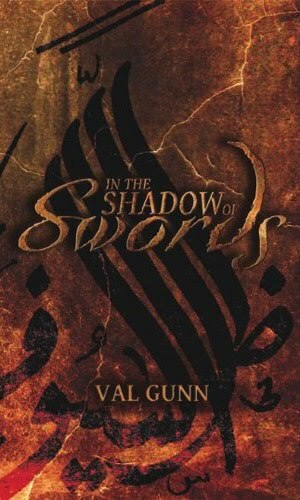 In the Shadow of Swords' setting is inspired by the Arab world instead, and it's a refreshing change - magic depends on a race of creatures mostly secured by a veil from reaching the normal world, the Jnoun, but these can be summoned for magical purposes, and their offspring likewise possess magical abilities. For me, it's great to have some different inspiration for worldbuilding, and a number of calls have been made for 'multicultural fantasy': In the Shadow of Swords is definitely a step towards this. The one (relatively minor) aspect of the worldbuilding that I didn't enjoy so much was the constant introduction of new terminology: although a little is great, there were some chapters where it was introduced a little fast to remember and became distracting instead. In the Shadow of Swords is a very fast-paced book: perhaps some readers may find its pace too rapid to keep up with, as chapters begin and end very rapidly, often covering vast distances in a single page. Nevertheless, it's definitely an antidote to any slow epic fantasy you might be reading! Gunn also keeps his cast nicely small: with the exception of a few 'one scene wonders', we're limited to the leader of the Jassaj agents, Sarn himself, and Mirin Altair, all of whom form nicely and alternately sympathetic and believable protagonists, though on opposite sides of the conflict. There are flaws: aside from those mentioned, there's more instances of 'tell' than 'show', but this can be forgiven for such a fast paced book. All in all, it's a relatively light, good read recommended as the antithesis to any plodding quasi-European novel you might be reading. I'm looking forward to the next book in this series. I enjoyed the heck out of this book. Really nothing else I read that comes close to his style (fantasy that is) and story. Can you think of any? What you've got is a modern, espionage novel wrapped within a mythic, Middle-Eastern setting. The only time I really stumbled was with some of the obscure language/terminology. I also thought the McGuffin was the weakest element of the book, but even this wasn't bad at all. His writing is strongest with building tension and action scenes. Yeah, I had a few problems with the terminology as well - I think fewer terms would have been better used. Actually, I disagree slightly on the McGuffin, though: although it didn't have much of a direct role, I think its -implications- (the treaty) gave it a more interesting significance than in some other fantasies. Frankly, some of these utilitarian artifacts are a bit overused in my opinion(basically, anything used to magically fight the antagonists, which is irritatingly common. I'll coin a corny 'magic firestorm rod' ( :P ) for an example). Thanks for commenting! Quick Quote and What's Next?